It's 09:00 in Lake Luzerne, USA right now. 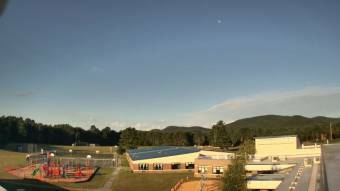 Stuart M Townsend Middle School A webcam in Lake Luzerne, New York - camera location: Stuart M Townsend Middle School. Glens Falls, New York: Glens Falls Middle School, 9.6 miles away. Schuylerville, New York: Schuylerville High School, 19.7 miles away. Ballston Spa, New York: Ballston Spa Central School District, 21.9 miles away. Schenectady, New York: St Madeleine Sophie School, 35.2 miles away. Bomoseen, Vermont: Crystal Haven, Crystal Beach, 39.1 miles away. Manchester, Vermont: The Equinox, 39.9 miles away. Eagle Mills, New York: Landscape View, 42.3 miles away. Troy, New York: Sacred Heart School, 43.4 miles away.